Google Chrome browser extension named eSpeedDownload is considered one of the many unwanted program that belongs to family of adware. This time, it claims to easily manage and sort out every downloaded file right at your Google Chrome browser. It can sneak onto the computer while taking advantage of free programs currently offered on various websites. Once user executes the freeware where it is bundled, eSpeedDownload immediately modifies certain settings on Google Chrome. Most affected is the homepage, which will present a new homepage and supersedes the preferred settings of user. In addition, eSpeedDownload overrules default search engine. When searching the web, this adware redirects all inquiries to alternative websites wherein customized search outcome includes paid links and other promotional materials. Adware makers intend to confuse web users so that they may not distinguish result links from paid links. As such, user may unintentionally click on links that can generate profit via pay-per-click scheme. As you can see, existence of eSpeedDownload is merely to gain revenue online. Although it is promoted as a fast and secure download manager, the main intention is to present advertisements. This deceiving moneymaking scheme by eSpeedDownload keeps on annoying so many users who have the extension on their browser. Therefore, these victims are in need of quick and effective solution to get rid of the adware. For this reason, we are publishing the most efficient way to remove eSpeedDownload from the browser as well computer systems. Our procedures will not only take out the Adware. Much more, we aspire to remove suspicious freeware that established eSpeedDownload. Please follow the guide in exact order to ensure complete removal of all malicious programs from the computer. 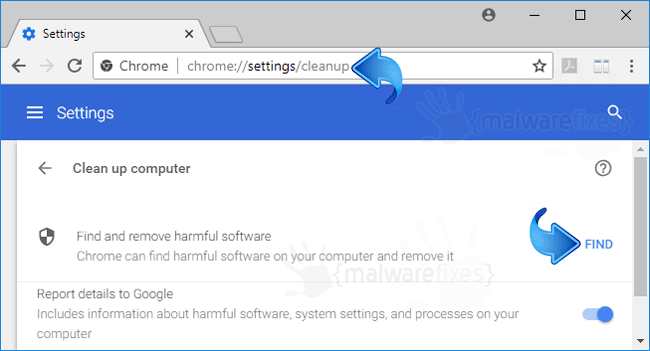 We are presenting various options to remove eSpeedDownload from Google Chrome browser using only internal functions and approach. Most of browser annoyances can be fixed via these processes. If eSpeedDownload persists after executing these steps, it is better to run anti-malware scan as suggested below. 3. On Extensions window, please delete eSpeedDownload by clicking on Remove or Trash icon. 4. Google Chrome will prompt for the confirmation of eSpeedDownload removal. Please click on Remove button to proceed. 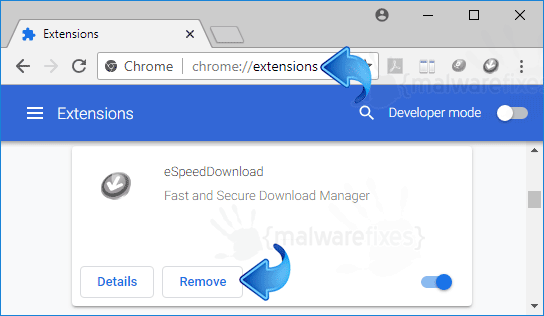 Resetting Google Chrome to default settings is helpful in deleting hard-to-remove extension such as from eSpeedDownload. This method is highly advisable to perform if you have difficulty in removing unwanted extension. This function will reset your home page, new tab page, search engine, and other areas affected by eSpeedDownload. Unwanted extensions will also be removed from the browser. This will not affect your bookmarks, history, and other saved data. 3. Look for and remove eSpeedDownload entry. If not present, look for any suspicious labels that was installed recently. 6. Next, click on Threat Scan. This is the most comprehensive scan method that will surely find any hidden items linked to eSpeedDownload. 8. 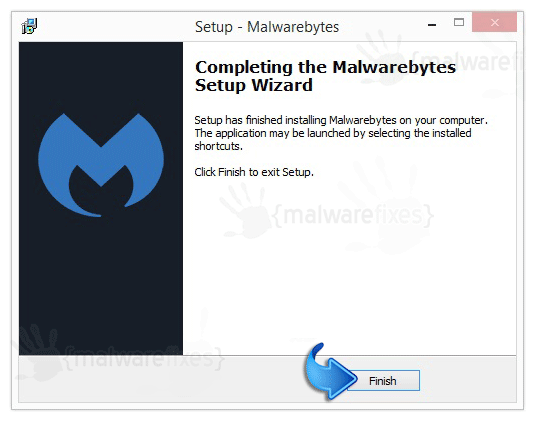 When scanning is done, Malwarebytes Anti-Malware will display the list of identified threats. 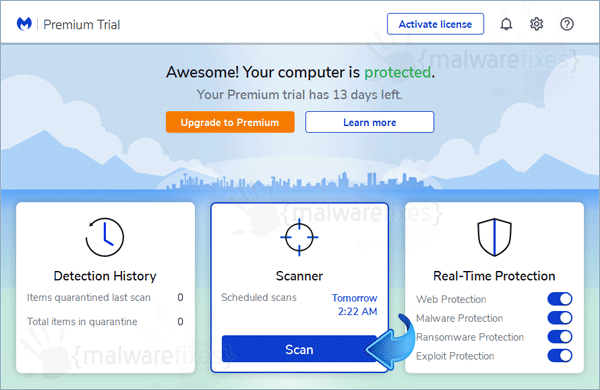 Remove all identified threats including eSpeedDownload and restart the computer to finalized the scan process. 4. It searches for presence of harmful programs, plug-ins, add-ons, or any data that were found malicious and linked to eSpeedDownload. You need to Clean all items detected by this tool.